Get outdoors at Fishing Charters & Tours and Cocoa Beach. Your inner history buff will appreciate Ybor City and Cocoa Village. 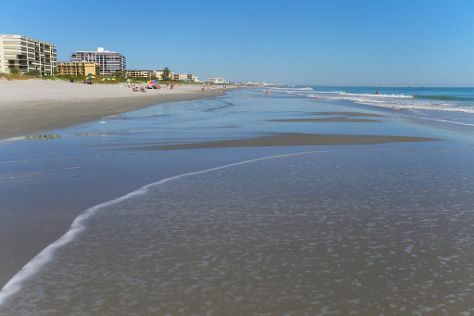 Explore Kissimmee's surroundings by going to Cocoa Beach Pier (in Cocoa Beach), Beach Walk (in Clearwater) and Tampa (Sacred Heart Catholic Church, Busch Gardens, & more). Plan for a day of cool, family-friendly fun on the 15th (Thu) at Legoland Florida Resort. And it doesn't end there: take a stroll through Old Town, look for gifts at Old Town Portrait Gallery, find something for the whole family at Fun Spot America Kissimmee, and pause for some serene contemplation at Corpus Christi Catholic Church. To see photos, maps, where to stay, and tourist information, you can read our Kissimmee travel planner . In August, daily temperatures in Kissimmee can reach 91°F, while at night they dip to 76°F. Wrap up your sightseeing on the 17th (Sat) early enough to travel back home.